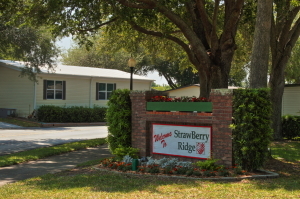 StrawBerry Ridge is a gated community just east of Tampa, Florida, that caters to older adults who wish to enjoy the Florida lifestyle affordably. Owned and managed by award-winning developer Blair Group, our tight-knit community is a place where an older yet still-active adult can live in an affordable, low-maintenance home and be able to participate in a wide range of stimulating activities, all without having to step outside the community’s gates. Indeed, our gated community isn’t just a place to live … it’s a lifestyle! StrawBerry Ridge has long been instrumental in helping active older adults stretch their savings to the fullest through a combination of low-cost manufactured homes and a wealth of amenities and structured activities right on site. A major plus of living at StrawBerry Ridge is being just a short car ride away from all of the sights, attractions, and conveniences of the bustling Tampa Bay area. There is a major airport nearby, as well as first-rate medical facilities, public golf courses, performing arts venues, and of course world-class beaches. Contact StrawBerry Ridge today for additional information about our gated community near Tampa, FL.